AcadeCamp is an innovative summer programme allowing campers from ages 5-9 to experiment, ask questions, and get messy, tout en français. Science, Technology, Engineering, Architecture and Math (STEAM) demand inquiry, connection, experimentation and exploration, and with these processes at play, there is an unpredictable product until the very end. Each week, a Maker Faire project is incorporated and campers will be challenged to design and build a take-home product that encompasses their learning in Science, Technology, Engineering, Architecture and Math (STEAM). 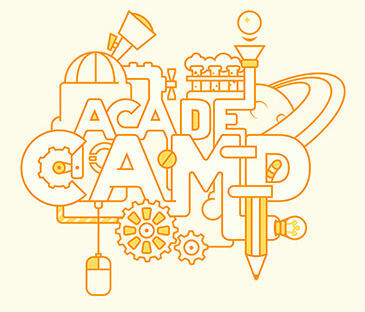 For mastering STEAM skills and showing positive attitudes, AcadeCampers will collect stamps which will be added to their complementary AcadeCamp T-shirts. How many can a T-shirt hold? In addition, expert guest speakers and walking distance field trips will engage the youngsters in real-world learning. Download the ACADECAMP 2017 registration form here. Mmmmmm, DIRT! This get-hands-dirty session is for campers fascinated with the stuff we take for granted, but which provides everything from habitat to nutrients essential to the life cycle. Campers explore the denizens, constituents, and properties of soil to bring this hidden world up close and deepen their understanding of and connection to all living things. AcadeCampers will design and construct take-home terrariums, creating micro-environments that unfold and change over time. They will learn loads about small organisms (sow bugs, isopods, earthworms, snails…) that will become their terrariums’ inhabitants. For campers who love to collect pebbles anywhere, they will definitely build up a stockpile here! Campers will also explore the difference between rocks and minerals, classify their collected treasures, and identify “mystery rocks”. This session will unlock their understanding of the processes that lead to the formation of igneous, sedimentary, and metamorphic rocks. Unique “hands-on” clay modeling activities will also provide AcadeCampers with insight into the rock cycle and plate tectonics. Our young geology experts will design and build their own rock tumblers to polish pebbles, to add to their collection, and use in jewelry designs, pet rock creations and more! The invisible forces in nature visibly impact natural and engineered structures. Through interactive experiments on: compression, tension, shear, bending and torsion, this week’s AcadeCampers will explore how powerful forces in nature interact and impact our natural and engineered environment. And just like Architects, Building and Civil engineers, our AcadeCampers will weigh the impact of types of forces when designing and building a structure able to withstand nature’s forces. The ACCamp Learning Express is ready to take campers on a ride, travelling through Airplane Avenue, Rocket Crescent, Train Court, Bicycle Alley and Automobile Drive, all the while discovering how motion makes the world go ’round. Through hands-on experiments, AcadeCampers will be introduced to Sir Isaac Newton and the “Principia Mathematica Philosophiae Naturalis”, his three laws explaining the concepts of forces and motion. This week, the Maker Faire challenge, awaiting our budding Nautical Architects and Maritime System Engineers at the Boatville Dock, is to design and build a floating watercraft selecting buoyant materials and applying the Archimedes Principle. Bubbles and children, perfect together! AcadeCampers will celebrate the round form by going outdoors to find bubbles in nature and uncover the cool science and animal behavior behind the bubbles. From imaginative experiments: “Bubble Shapes” and “Bubble Measurement” to “Bubble Skeletons” and “Body Bubbles,” campers will combine intense enjoyment with learning about light and color, aerodynamics, chemical composition, surface tension, and even technology. They will inquire about bubbles found in nature versus child-blown bubbles. At Friday’s Bubble Challenge, our young Engineering Chemists will showcase their unique bubble-blowing instrument and finest solution to blow the largest, long-lasting bubbles, ever! What is this green, oozy goop from outer space? This week, AcadeCampers will form small laboratory teams to examine (under the microscope), experiment with, and hypothesize about this green, oozy goop from outer space. They will compare what they do to the work of NASA scientists on the Mars Rover mission and to the methods of analysis of other professional scientists. How best to discuss and share their experimental findings, but to hold a scientific convention and collaboratively name this green, oozy goop! AcadeCampers will then turn into Aerospace Engineers to design and to build, through kit bashing, a spacecraft that can successfully land on an ocean of this green, oozy goop. Ever wonder what it would be like to live on the moon? Who on Earth has already spent time on the Moon? Learning about the Moon’s distance from Earth, its topography, gravity, temperature range, length of day and orbital period, campers will decide where best to set up their lunar colony. Young Moon Researchers will diligently establish daily-life support requirements for a person to live on the Moon, then investigate how many people could live there and off the lunar land. 10, 9, 8, 7, 6, 5, 4, 3, 2, 1, ZERO countdown to building AcadeCap’s Lunar Colony using Minecraft! This week’s young Food Engineers will undeniably get an out-of-this-world experience eating aeroponically and hydroponically grown food in a simulated lunar green-house! Is Code the creative language of the future? Junior AcadeCoders, for campers, as young as four years old, learn the essential building blocks behind object-oriented programming by creating stimulating, interactive stories and simple games. They will let their imaginations run wild and will learn programming basics with Scratch through interactive storytelling… About Lunarians finding green oozy goop, maybe? Kids think creatively and will learn how to program their own stories, games, and animations, as well as how to share their creations on the web. Junior AcadeCoders take home a copy of their own game at the end of this Scratch programming camp. It could be the start of something BIG! For students with reading and writing difficulties, we offer Orton Gillingham-based multisensory teaching sessions, in addition to the activities provided during our AcadeCamp or AcadeCoders sessions. The OG multisensory teaching sessions will be offered for 1 hour, 5 times a week (4 times a week during holiday weeks), and the participant must register for at least 4 weeks, or preferably all summer, in order for the programme to be effective. If a student has not been evaluated previously, pre- and post- testing will be provided. With the Orton Gillingham approach, a student learns using the visual, auditory, kinesthetic, and tactile senses simultaneously. The OG multisensory teaching sessions will take place within the 9:00 am – 4:00 pm camp day. For more general information, please read Acadecamp Outline Schedule Page and Frequently Asked Questions Page. Download the ACADECAMP 2017 registration form. The form can be filled electronically. Please email filled forms to info@acadecap.org. Come and join AcadeCamp 2017! No Comments on "AcadeCamp 2017"